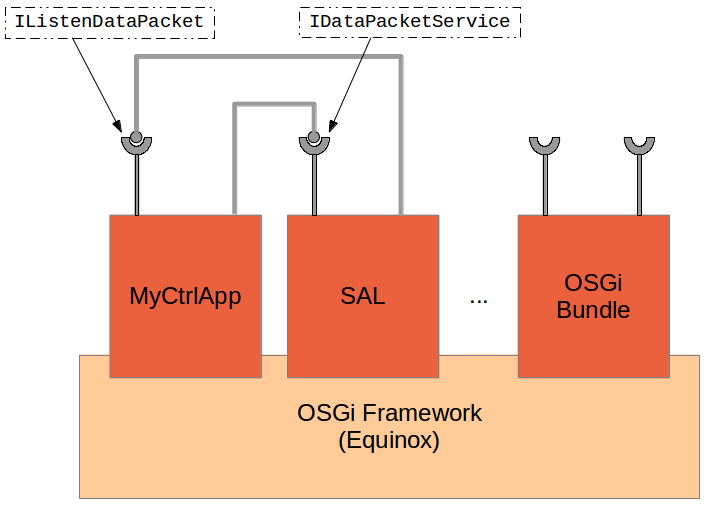 This entry was posted in networking, OpenDaylight, OpenFlow, SDN, Uncategorized, XNC and tagged hydrogen, maven, networking, opendaylight, osgi, sdn, xnc by Frank Dürr. Bookmark the permalink. did you created the project using mvn or project folders are created manually. from the root directory (~/myctrlapp in the given example). Afterwards, you can import the project into Eclipse. I am trying to use this example but it seems that the receiveDataPacket method is never initiated. I have stopped other OpenDaylight services that also implement a packet listener but this is not helping either. I am using the controller together with Cisco c891 router. – download the example from my next post and try it to see whether there might be a problem copying code from this post. – check the log output to make sure that all necessary methods for registering for packet-in events have been called (you can adjust the log level using “setLogLevel de.frank_durr.myctrlapp.PacketHandler trace”). It’s important that the mehthods configureInstance(…) and getImplementations(…) have been invoked. – use tcpdump or Wireshark on your controller host to see whether packet-in events actually arrived at the host (this is quite low-level).